This DNA based test is carried out at this laboratory based on information provided by Dr Jonathon Beever of the University of Illinois. All genetic material in an individual animal comes in pairs, including the area of DNA where the mutation responsible for Hypotrichosis in Hereford cattle occurs. Each individual has a pair of markers (alleles) for the Hypotrichosis mutation, and has inherited one from the sire and one from the dam. Hypotrichosis in Hereford cattle is inherited as a simple autosomal recessive trait. This means that for an individual to be affected by the disease it must have 2 markers for the mutation (1 from the sire and 1 from the dam). Those individuals that carry 1 marker for the mutation and 1 normal marker will be unaffected by the disease, but can pass the mutation on to their offspring. The purpose of this test is to detect the carrier individuals – those animals carrying 1 copy of the mutation responsible for Hypotrichosis, but unaffected by the disease. No responsibility will be taken by the NZHA for untested animals purchased. It is compulsory for any imported genetics to be tested. It is compulsory for all Beef Expo entries to be tested declared & free. 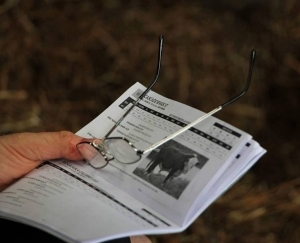 From 1 January 2014, ALL bulls (of any age, incuding calves) sold for transfer must be correctly sire verified in conjunction with having a DNA profile. Also must be tested and declared FREE of hypotrichosis. The DNA tests for the Diluter gene and Idiopathic Epilepsy in New Zealand Hereford cattle have now been validated and are available at Massey University. The DNA tests are based on information provided by Dr Jonathon Beever of the University of Illinois, who developed the DNA test for Hypotrichosis that is currently being used. The tests for both abnormalities will be carried out, free of charge, at the same time testing for Hypotrichosis is done ($35/sample). However for samples previously submitted for Hypotrichosis testing and requiring further analysis for Dilutor and Idiopathic Epilepsy will incur a cost of $25/sample. This genetic defect is caused by the deletion of a small part of DNA and causes dilution to any black pigment or black hair. Herefords can carry the Dilutor mutation but will show no outward signs of the syndrome as they do not have any black pigment. The Diluter gene is inherited as a dominant gene so when a carrier Hereford is mated to an animal with black pigment, e.g. a Friesian or an Angus, 50% of cases they will produce offspring with a diluted coat colour – grey, smoky or chocolate in colour. In addition to the change in colour the dark areas can show signs of hair loss. The areas with white hair appear normal. A predisposition to cold stress and poor growth rate can occur, at least in the first year. All genetic material in an individual animal comes in pairs, including the area of DNA where the mutation responsible for the Dilutor gene in Hereford cattle occurs. Each individual has a pair of markers (alleles) for the Dilutor gene, and has inherited one from the sire and one from the dam. The purpose of this test is to detect those carrier individuals that carry 1 or 2 copies of the mutation responsible for Dilutor. When a DL Carrier is mated to a DL Free Hereford, 50% of the offspring will be DL Free and not carry the diluter gene while 50% of the progeny will carry the diluter gene and be DL Carriers. These purebred Herefords will show no change to coat colour. The symptoms of Idiopathic Epilepsy (IE) generally start with affected animals seen recumbent on their side with limbs extended in a rigid state. The seizures may last from several minutes up to more than an hour. The age of onset of the first seizure can vary, from birth to several months of age. The occurrence and persistence of seizures may be modified by environmental stressors such as extremes of temperature or increased physical activity. IE is predominantly seen in horned Herefords, but can be seen in polled Herefords with horned animals in their pedigree. All genetic material in an individual animal comes in pairs, including the area of DNA where the mutation responsible for Idiopathic Epilepsy in Hereford cattle occurs. Each individual has a pair of markers (alleles) for the Idiopathic Epilepsy mutation, and has inherited one from the sire and one from the dam. Idiopathic Epilepsy in Hereford cattle is inherited as a simple autosomal recessive trait (like Hypotrichosis). This means that for an individual to be affected by the disease it must have 2 markers for the mutation (1 from the sire and 1 from the dam). Those individuals that carry 1 marker for the mutation and 1 normal marker will be unaffected by the disease, but can pass the mutation on to their offspring. The purpose of this test is to detect the carrier individuals which are those animals carrying 1 copy of the mutation responsible for Idiopathic Epilepsy, but unaffected by the disease. With the large number of Hereford bulls being used over black pigmented cows in both the beef industry (Angus) and the dairy industry (Friesian) it is relevant that the NZHA investigate the frequency of the Diluter gene in the pedigree Hereford population, as there may be issues with the marketability of ‘diluted’ grey, smoky and chocolate coloured calves. 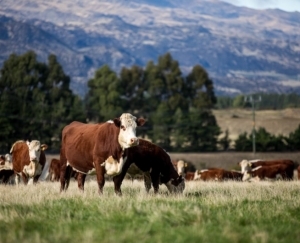 With respect to Idiopathic Epilepsy , the condition is seen mainly in horned cattle and polled cattle with horned blood in North American Herefords, so given the smaller proportion of horned cattle in the NZ population may mean it is less common. However this smaller horned population in NZ means that if the gene is present it has the potential to move quickly through the small genepool.